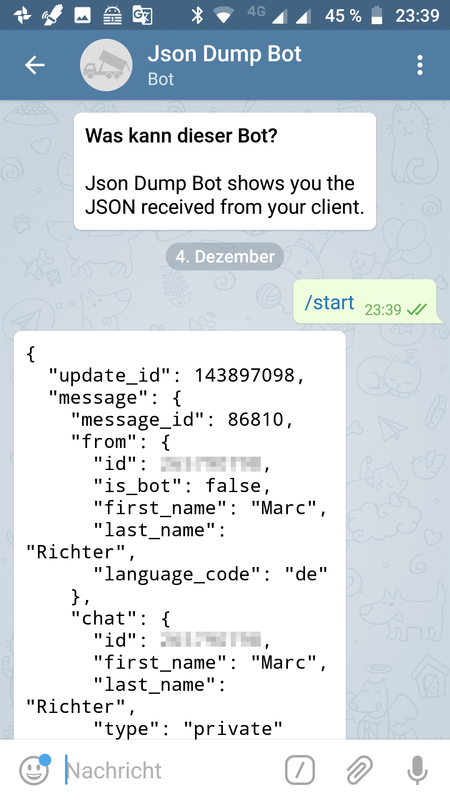 How to link the outside world (Telegram servers) with your bot’s code and data(base) now? Actually, with Django, that’s quite easy. But if you have never done something like this, you might feel a little lost here. … register a Telegram bot using “BotFather“, the official interface provided by Telegram to register bots for their service. … create a Django project to start your work in. … prepare your project to be easily repeatable by creating a virtualenv and a Pipenv file and thus prepared it to be deployed to a containerized environment. … register an account at your preferred code-hosting provider (Heroku, if you followed the recommendations of this guide). … register a project with your hosting provider to hold your Django project’s code, served by a Git remote and hook. … register a new app for your bot in the Django project. … create a database and configured your remotely deployed Django application to utilize it. … design your database models to hold the data needed from Telegram messages for your bot’s purpose. … applied the migrations, which are created from your models definitions, to your production code hosting database. So, the last missing piece we have left in front of us is somehow bringing all these efforts together by creating a view. OK, given the fact that we did not progress for more than a month with this project in the meantime (sorry for that, seriously 😢), let’s first talk about what it is that we are trying to achieve next. Personally, when I’ve got hit by the “Developer’s block” (which happens more commonly the more time I let pass before I sit down and continue with a project), it helps me to form an easy yet explicit sentence, describing the task at hand. For that, I’m trying not to think about what it was that I’ve done last time or the details of my initial plan or something; it helps to establish a habit of not interrupting your work in the middle of something, really since this allows you to do so and not having to re-think where you left off! Always try to establish something SCRUM evangelists would call a “potentially shippable artifact“, meaning: Something that could be added to a product already running in production without breaking anything but providing a new set of functionality or a good foundation to implement these in subsequent releases, at least. 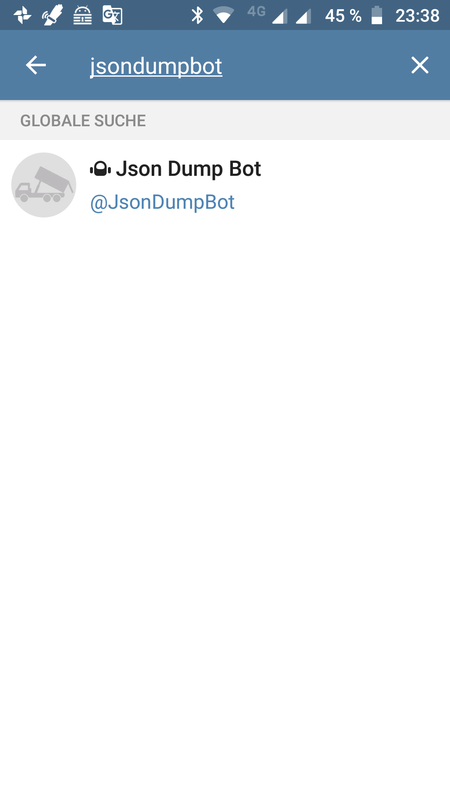 Create an interface (called “Webhook“), which the Telegram bot can connect to and submit messages it received. A view function, or view for short, is simply a Python function that takes a Web request and returns a Web response. This response can be the HTML contents of a Web page, or a redirect, or a 404 error, or an XML document, or an image . . . or anything, really. The view itself contains whatever arbitrary logic is necessary to return that response. This code can live anywhere you want, as long as it’s on your Python path. There’s no other requirement–no “magic”, so to speak. For the sake of putting the code somewhere, the convention is to put views in a file called views.py, placed in your project or application directory. So, let’s fire up our preferred editor and open the file bot/views.py (since we will make all our modifications inside our “bot”-application directory). So far, only our “Hello World“-static content-view called index is in there. Another interesting file in this context is bot/urls.py ; open that in your editor as well. If we define a URLconf for this (which we will do in the next step) and navigate to this without inserting some magic at the “please insert magic here” marker, Django would nevertheless render an appropriate HTTP answer, containing the string OK in its body. (dtbot-hT9CNosh) ~/dtbot $ git commit -m "Added hook/ URLconf and talkin_to_me_bruh - view"
Writing objects: 100% (5/5), 614 bytes | 0 bytes/s, done. remote: /app/.heroku/python/lib/python3.6/site-packages/psycopg2/__init__.py:144: UserWarning: The psycopg2 wheel package will be renamed from release 2.8; in order to keep installing from binary please use "pip install psycopg2-binary" instead. For details see: <http://initd.org/psycopg/docs/install.html#binary-install-from-pypi>. remote: 119 static files copied to '/tmp/build_ad22ed4ba6e462d165694bcc89345170/staticfiles', 375 post-processed. Obviously, our browser did not submit anything which could end up in the request object, handed over to talkin_to_me_bruh() . But even if it had thrown gigabytes of data at it, since we haven’t added any logic to process that data, it would always result in the same, shallow “OK”. user_id , being a unique IntegerField and acting as the primary key for our model. first_name , being a simple CharField, storing text up to a length of 64 characters. last_name , also being a simple CharField consisting of up to 64 characters. In part 8 of this series, we created this model. 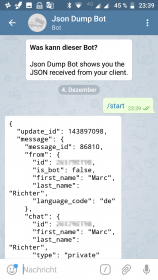 After having had a closer look at the JSON format being used for message exchange by Telegram, we found out that each Telegram user is identified by a number unique in the whole Telegram infrastructure. The logic we are about to implement here is to add YOUR Telegram user id to that table, enabling you to send messages to your bot that become stored in its database. Messages from any other user id will be discarded. Thus, before we implement any line of code, first add that user id of yours to your bot_user table either using the Django Admin backend in your browser or by using Python code for it 🐍. Since the first variant is quite obvious and also was shown in past parts of this article series, I will now show the one using Python code. ⚠ Attention: Make sure you fill the proper database in the following steps! I recommend to first do this in your development database, which is when the following steps are not executed in your Heroku – Environment, the SQLite3 one in your Django project folder, named db.sqlite3 by default. The pixelated areas are showing your Telegram ID. Let’s assume this is 123456789 for now; please make sure to use your own instead in the following examples. … wait a minute – “2”? That’s obviously not my real Telegram user id, but one fantasy-value I did choose when playing around with the Admin backend to provide a valid integer value. Let’s change that to my “real” user id ( 123456789). There you are – all set! … wait a second! Why are there two records for “Marc Richter” now all of a sudden?? Django’s manual states clearly that records are changed this way! So, why is there one record with user_id “2” and another with “123456789” now? The answer to this is, that since user_id is the primary key for this record and needs to stay unique, this is a bit of a special case. In the SQL – background Django is updating a row that is identified by its primary key. So, since this key itself changes, the query creates a new one instead. 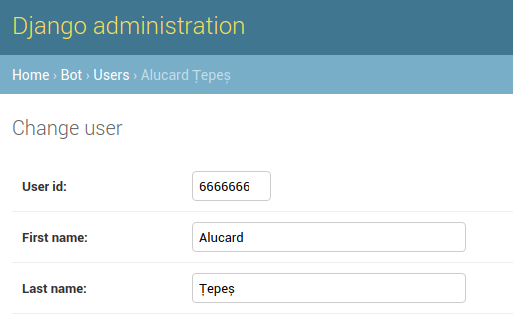 The same thing happens if you try to change this using the Admin backend to change the user_id field, by the way. Basically, all that is missing is to extract the JSON structure from that request element received and we are good to go! We will cover this only quite briefly for now to not extend this article too much. If you want to dig in deeper to that topic, check out Django’s excellent docs once more on Request and response objects. When a page is requested, Django creates an HttpRequest object that contains metadata about the request; like the scheme of the request (http or https), the path of the requested page (eg. “/music/bands/the_beatles/”) and so on. Then Django loads the appropriate view (based on the URLconf) and passes the HttpRequest as the first argument to the view function. So: This argument can be named anything you like it to be named, Django will always pass its HttpRequest object as this first parameter to your view function. Even though using a different name for this first argument is technically possible and completely valid, naming this request is a well-established convention that should not be changed without a good reason to not confuse other developers who might need to review or change your code in the future (when you need to provide code samples to the members of your favorite support forum, for example). Given a valid JSON data structure, we now have a standard Python object loaded to json_message ; if you have never worked with the json module before, please refer to its official docs (especially the conversion table) to learn about the data structures we might end up with here, in case you want to know something I have not covered here. Alright, so a dict it is. Our json_message object is containing a dictionary. That we can work with! … do I know you? You don’t say… Let me write that one down! That’s quite a lot that got changed in one go! 😱 Let’s go through it, section by section. First, we changed the imports; in case we do receive malicious JSON data or a message from an unregistered user id, we need to create an Error-Response object; that’s why we import HttpResponseBadRequest which does exactly that. For the date parameter of the Message model, we need to generate a datetime – object; so we are importing it now. The third change to the imports is a bit tricky … By default, Django tries to check for and verify a CSRF (Cross-Site-Request-Forgery) token for all POST requests (for an explanation of what CSRF is, please refer to Wikipedias article on it). This is a good security practice when it comes to forms and so on, but for public APIs, where we want these kinds of accesses, this is rendering our view useless. That’s what Django’s csrf_exempt decorator is for, so we import it here and add it to our talkin_to_me_bruh view function in line 12. At the beginning of _add_message_to_db , we introduce a try…except block which tries to extract the different elements from the provided dictionary. If any of these raises a KeyError or the value is not provided, the function returns None , signaling the calling section that we could not successfully extract the values and store the message to the database. Since we know what the Telegram JSON data is formatted like we can make this assumption of “Malformed or incomplete JSON data received” if this fails. Next, with _update_id_exists we check if the update id already exists in the database. If it is, we return True here, which is not entirely true, since we, in fact, did not end up writing to the database successfully, but the result is the same and the record is available already. So, this is supposed to be OK, I guess. If we come to the section where _is_user_registered is called this means that we could extract all necessary data from the request’s body and that the update id was not yet found in the database. So, we are dealing with a valid update here, which potentially needs to be written to the database. But not before we validated that the sender of the message is a registered user. This, _is_user_registered is taking care for. If this returns False , we raise an exception here, which is captured and leads to having an HttpResponseBadRequest object returned, stating “Sender is rejected“. If _is_user_registered returns True , we are trying to create and save this new record in one go, just like we did when we played around with this in Django’s Python shell before (please note that we imported Message from bot.models as well). With all arguments to Message , there is not much of a surprise, I think. The only thing worth mentioning is the date argument since it takes a datetime object. That’s just the way Django’s DateTimeField works. This is explicitly mentioned and explained in the DateTimeField section of the Model field reference. There’s no other chance than to look up this kind of things in the first time. Also, it is important to note that the sender argument takes an instance of the corresponding User object. This is because sender is a foreign key in our model definition and this is how this works in Django. If this succeeds, our function returns True, signaling to have written the message to the database successfully. With the if-statement following this function definition, we decide if we either return an HttpResponse object stating “OK” or an HttpResponseBadRequest object stating “Malformed or incomplete JSON data received“. And – that’s basically it! Let’s give this a final test-drive before we deploy this to production. By now, there should be made all changes to the code which we discussed already and there should be a user registered to your User model’s tables that has the user id “123456789” assigned. (dtbot-hT9CNosh) ~/dtbot $ python manage.py runserver Performing system checks... System check identified no issues (0 silenced). December 05, 2018 - 15:35:21 Django version 2.1.2, using settings 'dtbot.settings' Starting development server at http://127.0.0.1:8000/ Quit the server with CONTROL-C.
Noice that small “OK” in front of our prompt? That’s the response curl receives from our bot. Executing it a second time (sending the same message towards our hook) appears to be exactly the same for the outside world. Internally, our code noticed that a record with that update id is already there and directly returned that HttpResponse object. Indeed, just one record. Let’s edit the text of that in the Admin backend by something else and then re-run that curl command. If we are correct, our hook should still feedback success but not change that message record or add a new one. For me, this works. So should your code. Next, change the update id inside the json_file.txt and re-execute the curl command. 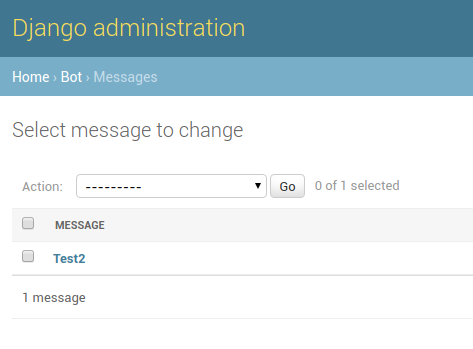 This time, a second message should have been added to your Message database (validate in the Admin backend once more). Congratulations! By now, you should be able to deploy your code to your production site by commiting the changes to your Git repo and push the changes to heroku remote. One last thing to make sure is to set your bot to Hook-Mode again in case you had switched that in the meantime. Please see part 4 of this series for a description how to do this. That’s it! Apart from the fine-tuning and the fact that your bot isn’t really doing stuff besides storing messages it receives right now, your Telegram bot is more or less ready by now! You can let this stay in Hook-Mode from now on, already. In the next parts we will add a bit of functionality to the bot. 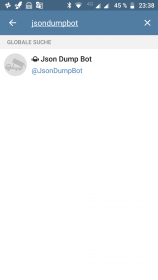 You just learned how to write a view that serves as a proper Webhook for your Telegram bot. Also, you learned how to interact with the database from within your code and the Python shell and how to find, set and update records. Finally, you enabled your project to receive and store messages. So you can send whatever text messages you’d like to store to your Telegram bot from now on. In the next article of this series, we will add a bit more functionality to the bot. Have it answer to the messages it receives, for example. Also, since this is about to become a bot to store your cash spendings, we will add pattern recognition logic to enable the bot to sum and track your spendings. Also, when we saw that we ended up with a doubled record in our User table, we realized that the current string representation of the records for that table is not really helpful, displaying the same lines containing “Marc Richter” twice. Having displayed the same name twice made it hard to identify the correct record for deletion. We will change that as well and by that see how to make changes like this to a database which has already records stored to it, using Django’s workflows.